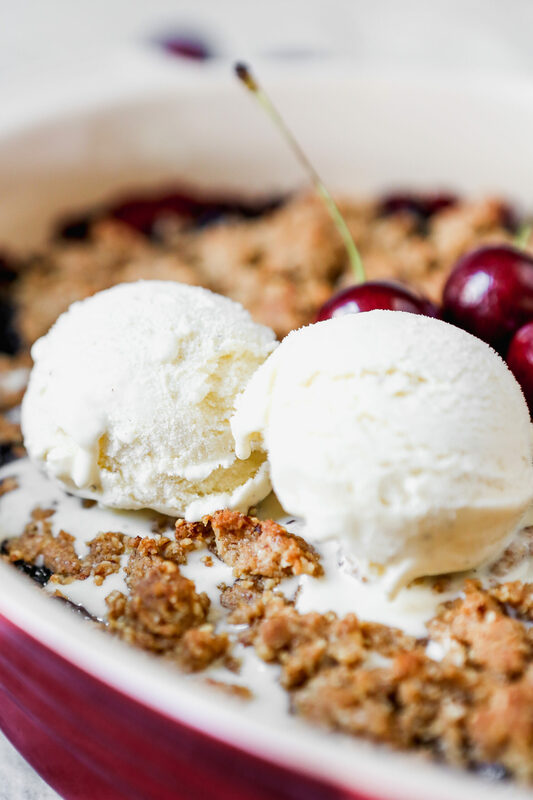 Learn how to make the best gluten-free cherry crisp with this recipe that tastes like it takes hours, but is surprisingly easy to make. It’s flavored with red wine, a trio of warm spices and almond, and is naturally sweetened with coconut sugar. 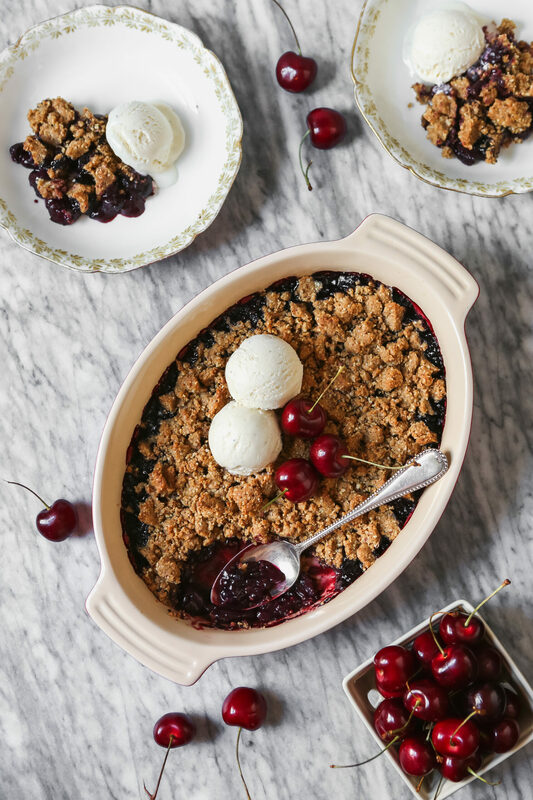 Fruit crisps are one of the easiest desserts to make. 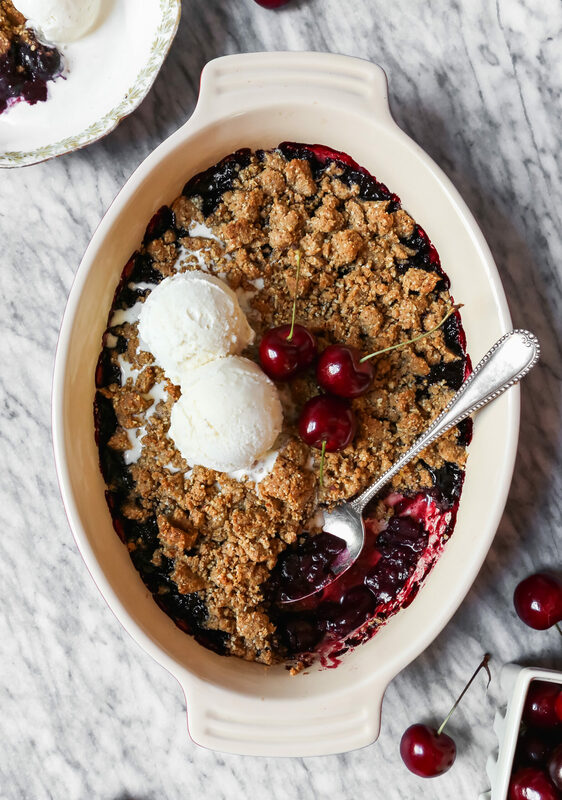 And to make one from scratch all it takes is cooking down fresh or frozen fruit, buzzing up a crumb mixture made of oats, spices, butter and sugar, topping the fruit with the crumb mixture and baking until bubbly and crisp. Voila! Easy as pie, well, easy as crisp, I suppose. The flavors in this crisp are out of this world. 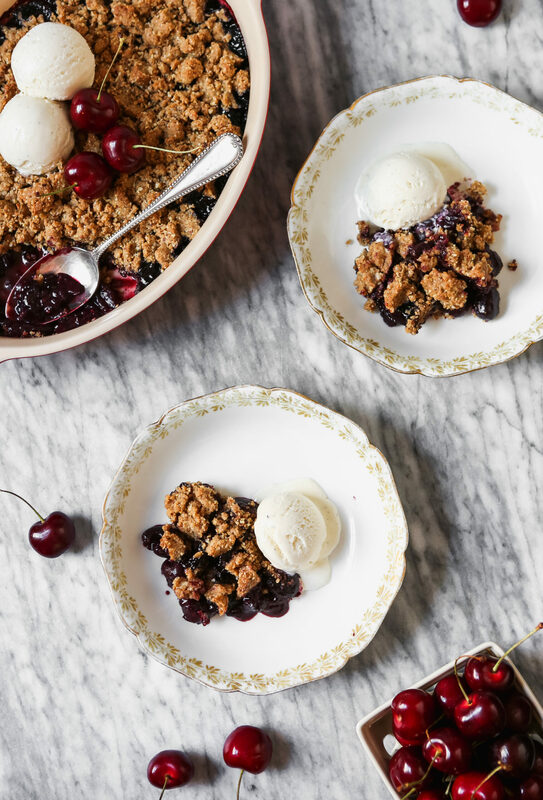 Just a touch of spice adds warmth to the fruit while almond is a natural pairing for cherry. And both red wine and coconut sugar add depth of flavor. 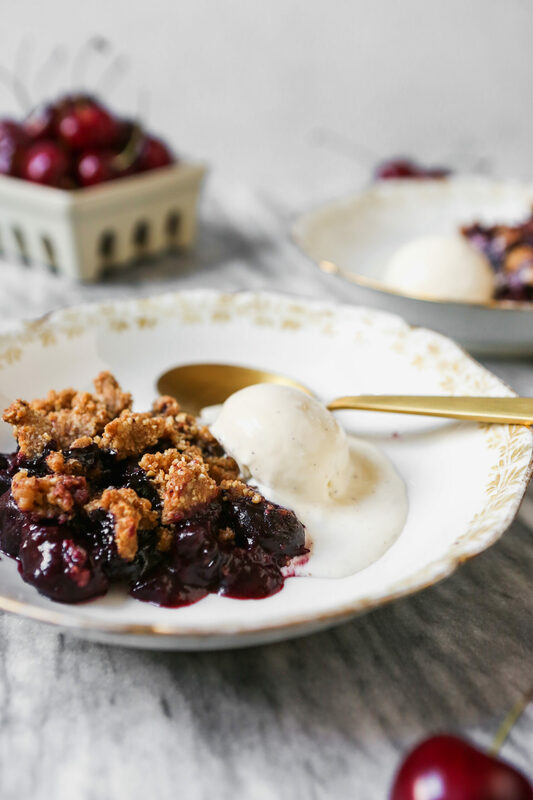 To guarantee this cherry crisp is gluten-free (if needed), first things first, make sure your oats are certified gluten-free. Secondly, you’re going to need a gluten-free flour blend, and my favorite go-to is NuLife Market. It works like a dream, seamlessly swapping in for all-purpose flour in just about any recipe. Of course, if you don’t need this crisp to be gluten-free, you can use regular all-purpose flour and it will work perfectly. When it comes to recipes, options are always welcome. 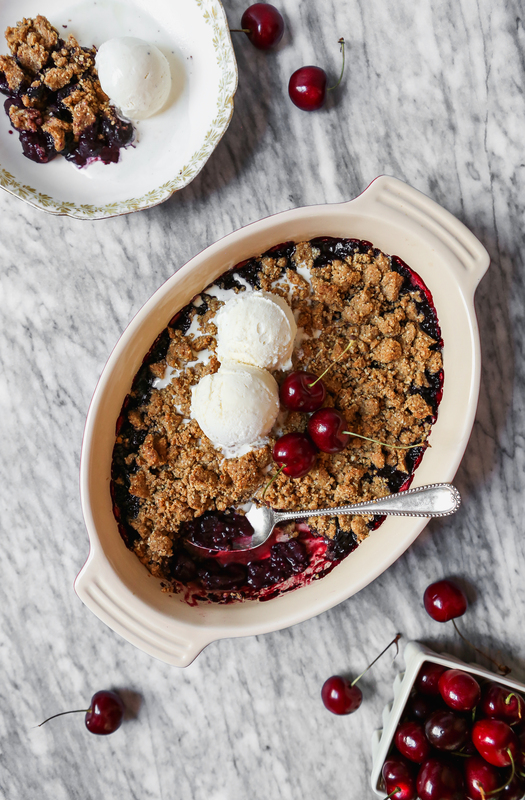 As for making ahead, which is so valuable these days, this gluten-free cherry crisp can do that too. Really any fruit crisp can be made ahead, that’s the beauty of them, they’re easy to make and freeze well. Want to prep the crisp a day or two in advance? Store the cooked filling and prepared topping in separate airtight containers in the refrigerator. When ready to bake, simply assemble as directed in the recipe and bake 5 minutes longer than directed. If you want to freeze the crisp for a later date, assemble as directed but skip baking. Wrap tightly in plastic wrap and foil, and freeze for up to 6 months. When ready to eat, heat oven to 400°F and bake frozen crisp for 25–30 minutes, 10–15 minutes longer than directed in the recipe. 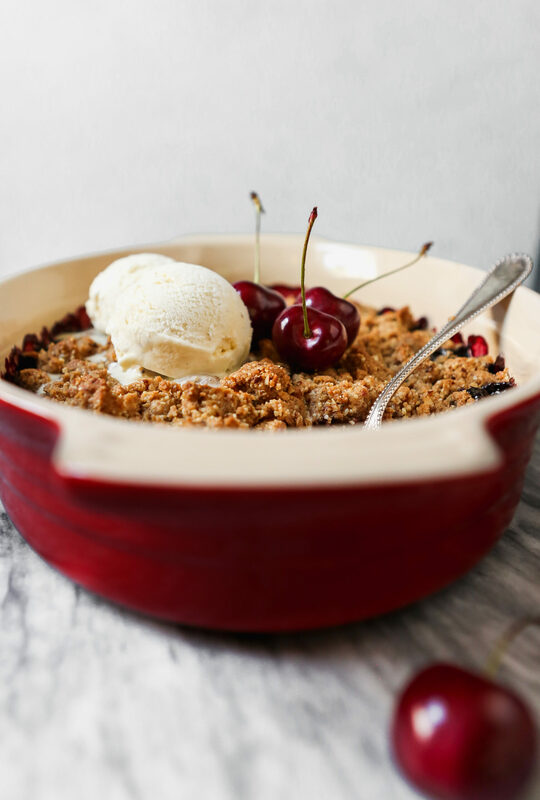 This is one of the best cherry crisp recipes! 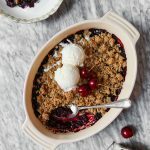 Flavored with red wine and warm spices, this crisp is gluten-free, naturally sweetened with coconut sugar, and perfect for making ahead. Heat oven to 400°F with rack set in middle position. Arrange almond and oats on a baking sheet and toast in oven until golden in color and fragrant, about 6 minutes. When cool enough to handle skin almonds; transfer to a food processor with oats. Grind coconut sugar in a spice grinder until finely ground into a powder, 1 minute. Transfer ground sugar to food processor. Add flour, cinnamon, cardamom, nutmeg, and salt; pulse until nuts are finely chopped, about 15 pulses. Drizzle melted butter, vanilla, and almond extract into processor and pulse until mixture resembles wet sand, about 5 pulses. If using frozen cherries: Microwave frozen cherries in covered bowl, stirring occasionally until thawed, about 6 minutes. Drain cherries in colander set over a bowl. Measure out and reserve ½ cup drained juice (supplement with water if needed). If using fresh cherries: skip microwaving and draining. Use ¼ cup water and increase wine to ¾ cup. Combine reserved juice (or water), wine, salt, cinnamon, and nutmeg in a 12-inch skillet and cook over medium heat until mixture measures ½ cup, 6–10 minutes. Stir in butter and lemon juice and cook until butter is melted, 1 minute. Add cherries and coconut sugar and cook, stirring occasionally, until cherries begin to soften, 5–8 minutes. Stir in cornstarch and simmer, stirring constantly, until liquid is thickened, about 1 minute. Off heat, stir in vanilla and almond extract. Transfer filling mixture to an 8-inch square baking dish set on a baking sheet. Pinch topping in ½ inch pieces, with some smaller pieces, and sprinkle over filling. Bake until fruit is bubbly and topping is golden brown, 15 minutes, rotating halfway through baking. Transfer to wire rack and cool 20 minutes. Want to use regular sugar? Use 3 tablespoons sugar for the topping and 1-2 tablespoons for the filling. Don’t want to make it gluten-free? Simply use all-purpose flour instead of the gluten-free flour blend. This recipe was inspired by a recipe from America’s Test Kitchen.